Last night we went to a holiday party down the road at our neighbor Peter and Sheila's house. An amazing multi level home over looking the ocean. It was a great opportunity to meet many of our neighbors from up and down the road as well as a road or two over. All very nice and welcoming. 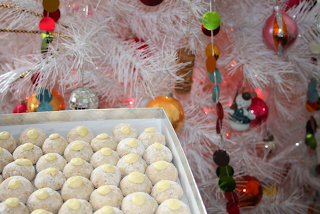 We took a box of the Lemon Snowball Cookies, but this time I made them a bit different. I made a lemon icing and topped each one with a small drop. It added just the right amount of extra lemon-i-ness! The box of 7 dozen was down to about a dozen by the time we left.... so I guess they were well received.